GENEVA 3.30.10 – The world’s largest atom smasher conducted its first experiments at conditions nearing those after the Big Bang, breaking its own record for high-energy collisions with proton beams crashing into each other Tuesday at three times more force than ever before. 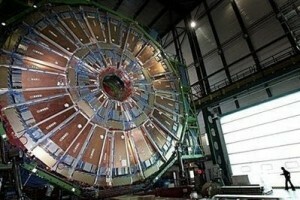 In a milestone for the $10 billion Large Hadron Collider‘s ambitious bid to reveal details about theoretical particles and microforces, scientists at the European Organization for Nuclear Research, or CERN, collided the beams and took measurements at a combined energy level of 7 trillion electron volts. Now, this is one amazing miracle. Some countries threw in $10 billions somewhere and let it spin in the space for 25 years and at random this gigantic smasher just appeared. Wow. If the scientists would just go back and read Genesis 1 they don’t have to waste their time and energy building this toy. All the answers they are looking for had been there for 5,000 years since it was written.